This means you can make ANYTHING related to pie...cherry pie, banana cream pie, mini pies, hand pies, whoopie pies, key lime pie martinis...your choice. Summer just makes me think pie! Post your creation on the last or next-to-last day of the month. I'll post my FOTM post by 12:01am on the last day of the month (and I'll include next month's theme). Right click on the image and choose "save image as" and save to your computer. When posting time comes around, add that saved image as a picture in your post. Copy and paste the code above directly into your blog post. This provides the logo and links right back to Bake at 350. (Leslie also made a darling little sidebar button, if you want to add it to your sidebar, please do...it's over in my left sidebar). ANYONE is welcome to join in...please do!!! And if you can't participate every month, that's ok, too. Alright....I'll see you back on July 31st! 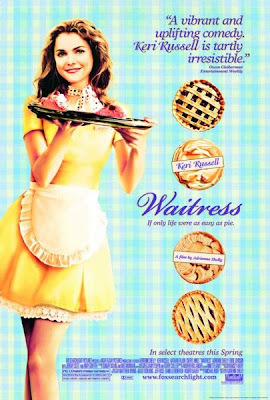 In the meantime, if you haven't seen the movie WAITRESS, please rent and watch it while you're making your pie! :) It's one of my favorites! My brain is already clicking away..
Good Grannies, this makes me want to chuck my diet out the window! This will actually be my first baking group. Yay, me! Wow this is tricky for me. Now I can think of ways to incorporate pie into my baking creation. But as for pie. Wow do you know I have never made a pie nor have I made one. Love that movie, it's so cute! I'm excited! Hmm...now what to make? I want to join, what do I have to do???? I did not see a poll or I would have taken it. Can't wait to participate. I already have a pie idea after reading my new food network magazine. I'm super nervous because it sounds VERY technical! P.S. Love the Waitress!! I own the movie. Oh I am super excited too! Since I am a newbie to the blogging world, this is the first official group that I am participating in! Thanks for organizing it. It is greatly appreciated!!! I am totally in, and now I totally want to rent that movie, LOL! PS I LOVE how creative we can get with the pie theme!! Sounds like fun - I love pie! Mmmm! Pie! Hummm? You've got me thinking. I can't wait to join in!! Until then, I'll be trying to decide what I should bake. I have an awesome berry pie I'd love to post, but I'm going to try to make something new for this. Really excited! I lurve me some piiihh (you gotta draw it out and say it right in that Texas way). Yeah!!! I love it! So excited, thanks for planning all of this. nutmegnannay...consider yourself joined! :) Jump on in! yay! I want to do this too! I have never joined a group like this, but I can't wait! What a wonderful idea. Please include me. It is time for a pie in my house but what kind of a pie? I guess that is my secret. Thanks for doing this. where do you copy and paste the button to on your blog? HTML???? WHERE??? Thank you. We're going raspberry picking on Sunday, I see raspberry pie in my future!! OK, done with the button adding. Now I am pondering a pie to make. I see so many things you can do with this, cheesecakes, muffins, cream puffs, etc. It is going to be fun to push my limits. hi i have just started my blog...can i please join in the flavor of the month? Sure, Lori! That would be great, link away!